On December 16, 1943, “capping off a year of miracles [in which Alcoholics Anonymous began in Canada] eighty people enjoyed a banquet at the Royal York Hotel and celebrated their new friends and more importantly, their sobriety … Eighty people had renewed their lives, many of them had arrived from the gutter and 12 months earlier, only eight of them had met – now they were tenfold.” (The History of AA in Canada). The Ontario Regional Conference as it has come to known had humble beginnings in one of Canada’s finest hotels of the time. The Conference moved around a bit for few years – the Central office at 1170 Yonge Street or ‘1170’, the Knights of Columbus Hall on Sherbourne Street and Central Tech High School until it settled in at the Royal York. In 1948, at Central Tech Bill and Lois W. were in attendance. Al-Anon began to participate as early 1956. In 1959, the first numbered conference noted that it was the 10th Annual Conference though current archivists in their research have found this to be inaccurate. 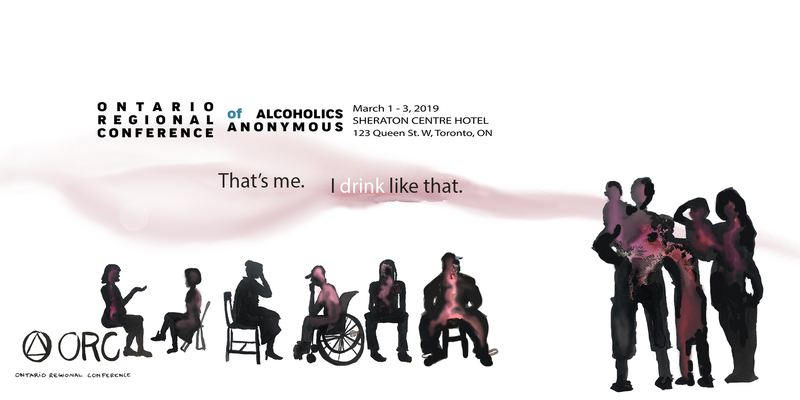 In 1961, the heads of Toronto’s churches and Mayor Nathan Phillips were invited bringing a new sense of legitimacy to the program of Alcoholics Anonymous in Toronto and attesting to the fine work of the Public Information (PI) and Cooperation with the Professional Community (CPC) committees in the AA service structure in Ontario. The Conference at this time was co-sponsored by Toronto Intergroup and the Ontario Provincial Committee which was in effect the precursor of the what is now the four Ontario General Service Areas. During the Conference, the Delegate would give their lengthy report of the business General Service Conference held each spring in New York City. In the early 1990s the Ontario Provincial Committee as such was disbanded as the Areas had fully ‘come of age’ and the Conference has since been sponsored solely by Toronto Intergroup. The Conference has evolved over the years from an evening event, to one day, two days and now a full weekend with talkathons, a banquet, and a dance. The location moved a few times in the 1980s and 90s. A few great highlights were in 1965 when the Conference planning was directed to that of the 13th International AA Convention held in Maple Leaf Gardens and where the Fellowship received the Responsibility Pledge. In 1993, the Conference was again held over in favour of celebrating 50 Years of AA in Canada at the Convention Centre. Toronto was blessed again in 2005 to host the 21st International Convention celebrating 80 years of AA and renewing the Fellowship’s commitment with the Responsibility Declaration. Over the years, trusted servants on the annual committee have been chosen by various means and accountability mechanisms have varied. In recent years it seemed wise given the size, i.e. average annual attendance hovers around 3000, and scope of the Conference and the enormous financial responsibility, that more stringent protocols be put in place to ensure tighter accountability in all operations of the Conference. That’s me. I drink like that.